The International Association of Registered Financial Consultants (IARFC) is offering specialty tours for guests during its 2018 Conference at the Biltmore Estate in Asheville, NC April 17-19, 2018. On the agenda are a Legacy of the Land Tour, a Red Wine and Chocolate Program, a Guided Garden Walk and an offsite Golf Outing at the Legendary Omni Grove Park Inn. They [Specialty Tours] are a memorable introduction to the history, diverse functionality, and beauty that is to be found within the spectacular Smoky Mountain acreage in addition to the gilded magnificence of the Biltmore mansion itself....IARFC Chairman H. Stephen Bailey, MRFC. Legacy of the Land Tour – Go back in time with a narrated tour on a Biltmore motor coach. Learn about the history of the land, structures, and former residents from a guide while visiting areas of the estate not usually open to guests. Red Wine and Chocolate Program – Hosted by the winery staff. Discover why chocolate and red wine is a match made in heaven. Including locally produced artisan chocolates from French Broad Chocolate and Chocolate Gems, the program centers on production of wine at Biltmore and chocolate where you will taste and experience the tactile attributes of a raw cacao bean and the process of farming origin-specific cacao and its influence on the finished product. You will sample dark and milk chocolates accompanied by four award-winning Biltmore red wines to determine which is more pleasing to the palate. A must-do for any serious chocolate or wine lover. 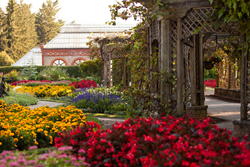 Guided Garden Walk – Enjoy a meandering walk through the estate’s Italian Shrub and Walled Gardens with a Biltmore host offering insights into the landscaping history behind the estate’s world renowned gardens, grounds and Conservatory. You will discover the choices made by George Vanderbilt and acclaimed landscape architect Frederick Law Olmstead and see how their designs have endured for more than a century. Omni Grove Golf Outing – Swing into a round of golf on the legendary 18-hole course at The Omni Grove Park Inn. The 6,400-yard championship course has been played by PGA stars Bobby Jones, Ben Hogan and Jack Nicklaus and even President Obama. Feel a sense of pride and accomplishment after navigating the tree-lined fairways and bent greens with amazing views of the Blue Ridge Mountains all around.